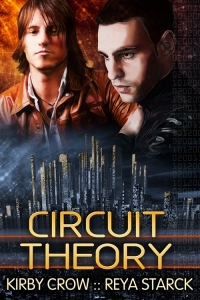 Welcome to the Circuit Theory virtual book tour! As a thank you for helping us celebrate the release of Circuit Theory, we’ll be giving one lucky reader a $10 gift credit to Riptide Publishing! To enter, just leave a comment with your email address included below. Earn additional entries by commenting along each stop of the tour. Thank you to MANtastic Fiction for hosting us and helping us celebrate this exciting release from Riptide Publishing! Writers chase their dreams across the page. In “Circuit Theory”, Reya Starck and I took elements and tools of virtual worlds that we knew already existed and pushed them a small step further. When people hear “science fiction”, they tend to think of giant spaceships or lifelike robots, neither of which truly exist yet. It’s not set in stone how far into the future a writer has to peer for the story to qualify as scifi, but I would say it’s about a millisecond. Real-life future romances like Circuit Theory are not only plausible, but inevitable, including the way that Dante and Byron rarely address their real-life problems and selves. Their avatars are what matter to them, their living presence in the virtual world, and how other virtual citizens participating in that world perceive them there. What exists in the flesh becomes much less important when most of your life is spent interacting through digital expression. The projection becomes the real you. We can already see the spores of this in several areas of social media. Our web presence and how our readers and Facebook friends and Twitter buddies ingest the parts of ourselves that we produce for them has become vital to our daily lives. The online presence that we create is how we want to be perceived by friends and individuals who interact with us solely through that medium. In Circuit Theory, the avatars of Dante and Byron are involved in a complex gay romance that follows carefully-orchestrated ground rules that only work inside the virtual realm of Synth. The problems they encounter are unique to that world, but surprisingly relevant to their daily lives. If you’ve ever been upset by someone unfriending you on Facebook, you know what I’m talking about. The importance to us of binary contact can’t be downplayed anymore. It’s part of the digital culture that we’ve created, and like all creations, it’s going to grow and transform into its own animal, despite the best intentions of its makers. In the time it takes you to read this sentence, the future is already here. Pleae include me in the contest! tmadamski@msn.com thanks! It really sounds like a great book…I’ve enjoyed this tour a lot! It’s been very thought provoking and interesting following your tour. Wishing you much success with your book! What an unique idea for a book!